OCCUPATION Retired Director, Pharmaceutical Manufacturing. In my penultimate year at Strathclyde University I was talked into joining the cross country team. The prospect of free travel to various university venues, followed by convivial drinking evenings was too much to miss out on. I did little more than make up the numbers, however I did master the skill of standing on my head and drinking a pint of beer. I have to give thanks to Innis Mitchell for his encouragement in those early days. On leaving university I joined Bellahouston Harriers and ran most of the time with Jimmy Irvine. Although I never thought of it as such I guess Jimmy was my first ever coach, and along with Jim Alder (Morpeth) they have been the two most influential people in my running career. At that time (early ‘70s) I occasionally ran with a group of “super vets”, on a Saturday afternoon. The group included some of the greats of Scottish athletics……….Gordon Porteous, John Emmet Farrell, Andy Forbes and the irrepressible Jack McLean. The pace was pleasant, quite undemanding, however the conversation was inspiring. It would have been impossible not to have been influenced by the successes of these three and by the total enthusiasm that exuded from Jack. Serendipity. In 1975 my wife and I decided to go and work in central Africa, on the border of Zambia and Zaire. By pure chance there were two other expat runners living in the same town. One was a runner called Dave Camp, a Morpeth Harrier who had represented UK at the steeplechase. The previous year he had beaten Malanowski (the Polish Olympic champion) in a Europa Cup match. Through Dave I learned what hard training was all about, especially interval training, and the discipline of running twice a day. There was no track, we measured out a grassy field, ran mostly barefoot and watched out for snakes. Hippos left big footprints that you could turn an ankle on, but they only came out of the water at night so that was okay. I returned to the UK a much improved runner. More luck. I got a job in the pharmaceutical industry and was based at Morpeth. Early on I met Jim Alder and a young lad called Archie Jenkins (who always seemed to finish just a few seconds in front of me). At this time, late 70’s and throughout the 80s the north east of England was a great place to be for running. Just about every race was contested by athletes who were truly world class (Alder, Foster, McLeod, Spedding, Cram et al.). They all seemed keen to turn out for the local races. To be merely a good club runner meant that you had to be close to international standard. 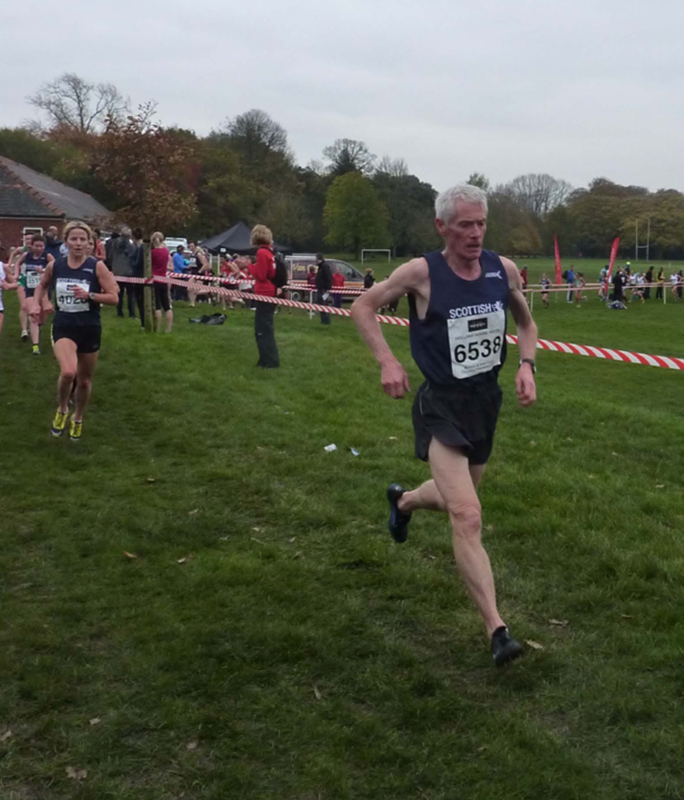 Jim Alder and Morpeth Harriers pulled it all together………..I owe them such a debt of gratitude. The thrill of still being able to run, to compete and to meet interesting and inspiring people. In fact as I’ve got older it’s become even better. The fun of it all and the memories. Parkruns publish age graded performance, and as you get older it provides an opportunity to make comparisons. Interestingly when I put my PBs, done in the 70/80s, into the age graded calculator on the internet and compare them with now they’re not so different (85-90%). So, I’ve managed to be quite consistent overall, nothing too flash. I don’t do mud (see later). To compete in a multi lap, firm course, suits me just fine and with that in mind I think that in this category I’d have to nominate winning the 2014 British Masters over 65 XC. The race was made easier for me by the hard work of Beryl Junnier and Jenny Forbes. I got some shelter from the gale by hiding behind them (although there’s not too much flesh to hide behind!!). It became a hard fartlek session, attack the hills and glide down the other side, the three of us just stayed together. Thanks ladies. On time alone I suppose my best would be the Brampton “10” in 50:00….I think of it as a 49:60. In 1986 I finished 3rd in the Scottish marathon. I chased Don McGregor all the way up from Leith to Meadowbank and the gap never changed from 28 secs. In 1980 I turned out for Morpeth at Gateshead stadium in a GRE Cup match. I won the 10000m in the morning in 31:30 and then ran the 5000m for additional points in the afternoon in 15:22. Neither run was a PB but it was a satisfying, unusual, double. The potential is there any time I put spikes on country. I finished about 300th+ in the Northern XC once, at a place called Pity Me, Co. Durham. Oh how appropriate was that name and how merciless were the gang at Morpeth in mocking me. I’m no fan of muddy cross country (Pity Me probably scarred me for life!). I enjoy road racing, and most of all road relays. And at the top of the pile has to be the National 12 man relay at Sutton Coldfield. Despite running for a great club we never achieved medals, such was the standard. Once again, everybody turned out for their clubs and it was a real who’s who of British athletics. So, the last ambition is to run for an over 65s team and gain a medal at Sutton Park. I play occasional golf, but it’s just too time consuming (and I’m not very good!). From about age 45 to 60, because of business commitments, I had less time to commit to serious running. However, I did keep “jogging fit” and to create a challenge I completed the Munros. Every now and then I get a bit twitchy and think about embarking on the Corbetts. I’m interested in quantum physics. Even the most unlikely event has a probability of occurrence……….a bit like winning a medal at XC! The people, the characters, the training and the competition. It contributes to good health and fantastic memories. Despite my aversion to mud I have to admit that the Masters’ International is the highlight of my year. It’s just like being a student again…..a hard race, followed by a night of over indulgence and laughter (and you even get expenses from Davie!). It is appropriate now to measure my “mileage” in kilometres, the rationale being that it takes just about as long in training to run a km as it used to run a mile. In the 70/80s at Morpeth we did quite high mileage, 100 was not exceptional. 80-90 was about average. I now do about 90-100km per week, some of which is twice a day (4 or 5 times a week). My morning run is a slow 7 km, mostly round the local golf course. I tend to regard the benefit more for injury management. Sometimes I’ll just do slow distance runs for a while. A long run of 15-20 kms, a fartlek run of 10k and finally an anaerobic threshold run of about 25 mins at my half marathon pace. The latter is often done on a treadmill, again at age 65 it’s a bit about injury management and prevention. If more race specific then I replace the threshold run with an interval session of 10 times 2 or 3mins with a 1 minute recovery. I can’t maintain this phase for too long (ca. one month), and I always do one of the two (interval or threshold) on a treadmill. Any other runs are then done on the roads at a steady pace, not too fast. Only since I‘ve got older have I bothered with stretching. Now I do about 3 sessions a week (calfs, quads, hamstrings and IT band). I’m not sure of the benefit, but some people swear by it. It was at this point that I sent off a draft response to Colin Youngson. In typical pedantic ex schoolteacher mode (our very own Ichabod Crane! ), he informed me that my grammar and spelling were okay, but the narrative needed more substance. “Do not feel constrained by the questions”………..so here we go, PART TWO. The ageing process. I mentioned that I got back into racing proper, following a 15 year sabbatical, at age 60. Having made the decision to race I decided to try a few “fast” runs. I measured out a mile using my car and attempted an “eyeballs out” run. I did about 6min 10 seconds. Thinking the distance must be wrong I remeasured it with the car. Still a mile. So, the car must be wrong, I bought a GPS watch………….the car was proved correct, I had aged. Oh dear, and worse still it actually felt like 4:45 pace. Running in the 60-64 age group is really tough. No matter how well you run you’re likely to be close to the back of the field (especially in the international). Not good for the ego, and it requires much more of a time trial mentality, a very different mindset. Moving into the 65+ has been refreshing, it feels like racing again. Running against the ladies, a privilege afforded to the over 65s. I am well accepting of defeat now; however I can recall the first time I was beaten by a woman. The Great North Run in the 1980s. Inside the final mile she just ran away from me, amazing pace. The lady was Rosa Mota, she was most impressive and did win Olympic and European golds. This was the start of a slippery slope. Since then I’ve been beaten by Batman and Superman, but never yet a gorilla nor a banana. On the subject of impressive runs I think the one that made the biggest impression on me was seeing Ian Stewart (of Birchfield) running second leg in the E to G, for Aberdeen AC (1972). I believe that Colin has already mentioned this in a previous edition of the newsletter. It really was very special to watch. He was doing about four and a half minute miles and by comparison everybody else just looked pedestrian. Training. I’ve seen lots and copied many. Fundamental to them all seemed to be a high volume of miles; the quality within appeared more varied. Yet from the permutation of approaches there was a standard, lasting over about 3 decades, which we can only reflect upon but no longer witness. Were it not for the times set, and by so many, it could just be put down to the reminiscences of an aged generation. Many races are now won around Scotland in times that would have been little more than a hard training run. Try as I might I could never get inside 2:20 for a marathon. Our very own Colin Youngson and Alastair Macfarlane were comfortably inhabiting the region of 2:16 to 2:20, as were another 100 plus runners throughout the UK. And then there was another league of runners probably 30 to 50 (or more?) who could do 2:10-2:15. It would be churlish to demean many hard training youngsters who are willing to pound the roads, tracks and trails in all sorts of weather, all credit to them. But I am bemused as to how the overall standard has slipped.